It’s hard to believe, but Wild Turkey 101 8-year has been going strong since 1942. That’s 76 years – at least 76 years globally. While 8-year WT 101 is no longer available in the United States (the age statement was dropped in 1992), it continued in overseas markets and is still sold today. 76 years … I honestly can’t think of another American straight whiskey expression released year over year for that long, not without some change in age or proof. Even Jack Daniel’s Old No. 7 hasn’t gone that long without change. A product with that sort of longevity is quite the accomplishment. Wild Turkey should be proud. I’m often asked if export Wild Turkey 101 8-year is superior to domestic non-age-stated (NAS) Wild Turkey 101. I’ve reviewed numerous Wild Turkey 101 labels, export and domestic, but up until today I’ve yet to compare two different 101 labels from the same exact year. One could go back and simply average ratings from my past reviews to get some sort of idea of how things might stack up; but truthfully, nothing beats a good side-by-side comparison. If you really want to know how two whiskeys measure up (especially whiskeys of the same recipe and general age) you have to experience them in the same sitting. With that in mind, I’ll answer the call and examine an export and domestic Wild Turkey 101 from the same year: a 2009 export 101 8-year and a 2009 domestic NAS 101. Full disclosure – the domestic bottle is a plastic mini (50 ml). It does, however, have a decent fill level with no sign of tampering or improper storage. It’s not an ideal side-by-side comparison, but it’s a fair comparison nonetheless. It was first savored as a specially selected barrel-aged bourbon by a group of hunters seeking the remarkable wild turkey bird, a native of North America. Today it is distilled according to old-time Kentucky traditions, and matured in new charred white oak barrels until it becomes the legendary, smooth bourbon whiskey known as Wild Turkey. The famous name on this bottle comes from a group of wild turkey hunters, one of whom brought a special 101 proof barrel-aged bourbon on their annual hunting trip. In later years they always requested “that Wild Turkey bourbon” and to this day it is still hand-crafted in the same slow traditional way. 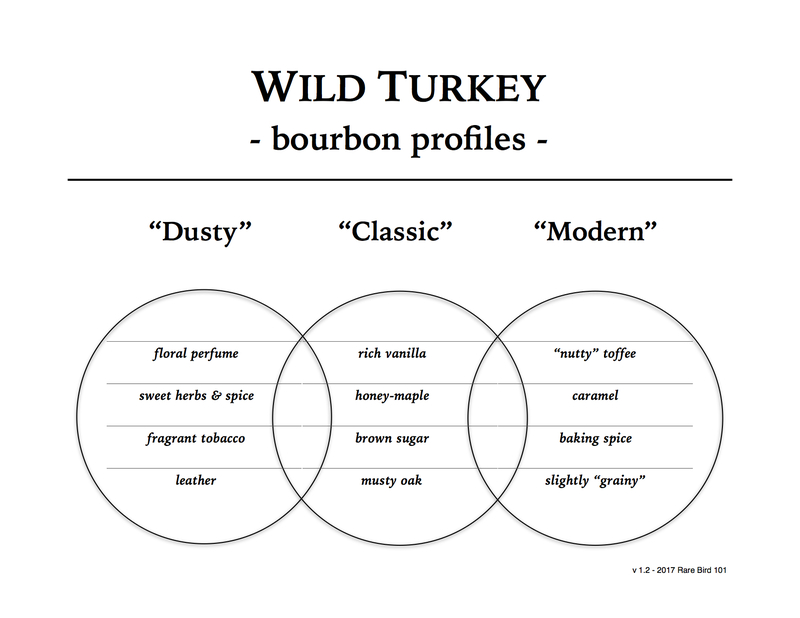 I think the differences in verbiage make perfect sense, as the export label gives a little more description regarding the uniquely American Wild Turkey name and the process of bourbon maturation – particularly the use of new charred white oak barrels (not a requirement of other popular whiskies, such as Scotch). The domestic label, on the other hand, briefly repeats the Wild Turkey origin story we’ve heard time and time again. Probably overkill, but hey – I’m sure there’s someone out there that hasn’t heard it yet. Alright, I think that’s enough label legends and lore for one post. Interesting, but nothing that’s going to change my opinion on how these taste. Folks, I think it’s that time again. Let’s pour! Overall: This is a damn solid pour. In many ways representative of the classic Wild Turkey profile, though it doesn’t really shine as outstanding or worthy of a premium. It’s complex enough to enjoy neat, yet nothing a standard retail Russell’s Reserve Single Barrel couldn’t provide. Those two expressions may not share the same profile, but the overall quality is similar. In fact, I’d happily take an average Russell’s Reserve Single Barrel over this 2009 Wild Turkey 101/8 without hesitation. Don’t get me wrong. Late 2000’s export 101/8’s are great daily sippers, but so is modern domestic WT 101. As with Russell’s Reserve Single Barrel, modern 101 may not be of the same profile but it’s certainly comparable in quality. Overall: Yep .. this one’s damn solid too. 2009 domestic Wild Turkey 101 is every bit as enjoyable as 2009 export 101/8. Are they the same? Not exactly, but close enough that one would likely miss the differences if tasted apart. When compared side by side there are nuances and subtleties that become present, yet not to a level of unquestionable distinction. Does the NAS domestic bottle taste younger? A little. It has a touch more pepper and “brightness” to it, in contrast to the export 101/8 which comes across a little more rounded. But again, these differences would be difficult to detect outside of a side-by-side comparison. Overall, a solid pour on-par with several modern Wild Turkey expressions. Closing thoughts: Each of these expressions are welcome in my cabinet any day of the week. That said, I’ll no longer be paying a premium to acquire them. While I appreciate the classic Wild Turkey profile (and probably always will), I’m now finding that certain modern Wild Turkey expressions have more to offer and are much easier to find. Yes, I have a blog that undoubtedly warrants the acquisition of past Wild Turkey releases. I get that and will continue doing so for reviews; however, when it comes to my personal Turkey purchases, 2000’s 101 will be much lower on the list than it has been in the past. That goes for both export and domestic WT 101. What can I say? Jimmy and Eddie are really making it hard to look back when there’s so much excellence sitting in plain and present sight. Cheers! Great and interesting article! And thanks again for the link to the Veach article on how bourbon has changed. Very informative! I’m with you – I can’t bring myself to pay premium for older expressions when modern WT has so much to offer. There are a few, such as CGF and Donut, that will always pull me in. But 2000’s 101 … very cool for a different profile. Certainly nothing to pay a premium for, however, with so many killer RRSiB selects out there. That’s how I feel about the 2005 101 I have open. It’s different but not necessarily better. Truth be told I prefer the modern profile 101 to the 2000s 101.